Have you ever run across a multiple choice question like this? Reed walked to the back of the line. used in the above sentence?" A. School will be back in session next Monday. B. I hurt my back when I fell on the ice. C. We sat in the back of the room. D. Write back to me as soon as possible. 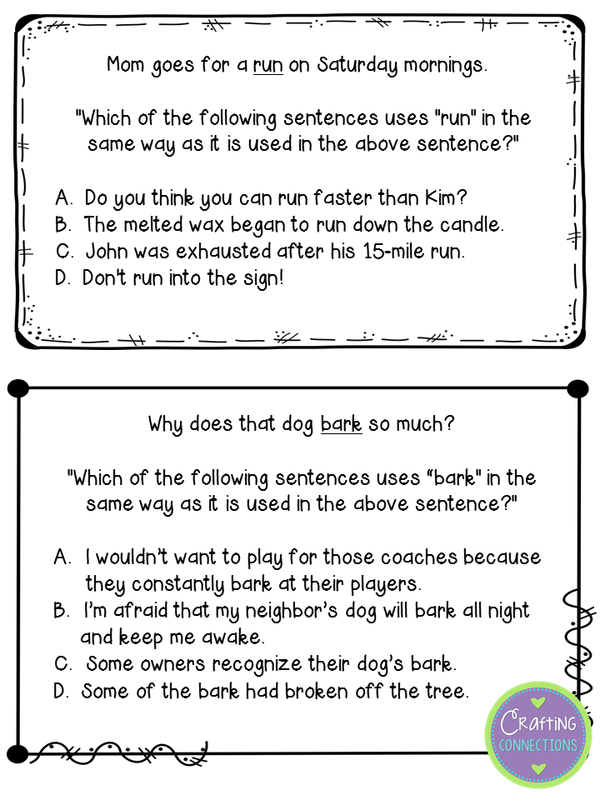 While providing testing accommodations to my ELL's, I watched students' eyes glaze over when they reached a test question similar to this. Who can blame them? This type of question requires students to have some advanced knowledge of multiple meaning words in the English language, and to use advanced reasoning skills such as analyzing, comparing, and contrasting. Furthermore, they have to understand what the test authors are even expecting them to do! 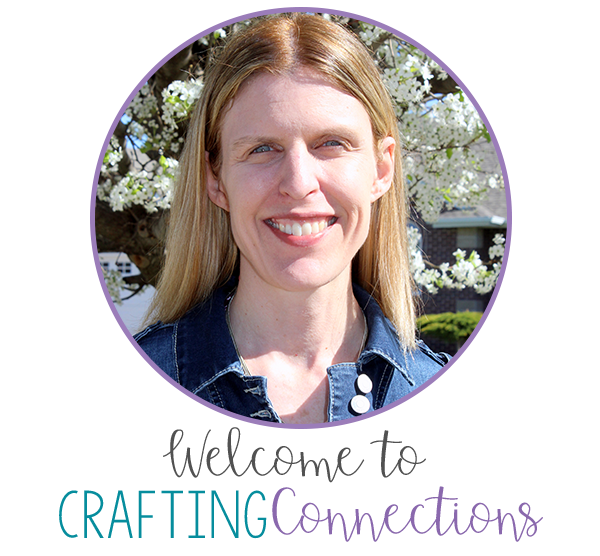 That's why I chose to share this lesson I have done with students, and make this topic the focus of today's blog post! I told my upper elementary students that a key strategy when it comes to multiple meaning words is to visualize- to paint a picture in their mind of how the target word is being used in a sentence. 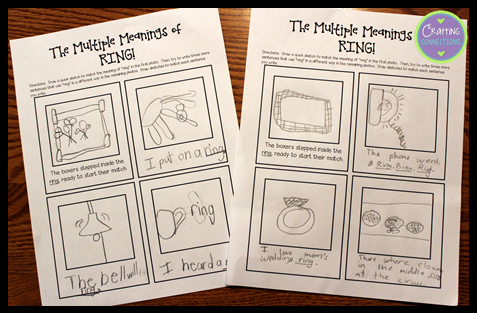 I started this lesson by giving students the following worksheet, and asking them to draw simple sketches (and write captions) that come to mind when they hear the word "ring". Clip art by Ashley Hughes. Download this HERE. After a couple minutes, I invited them to go ahead and share their sketches with a partner (which they are dying to do!) and discuss how many different meanings they thought of. Next, I uncovered my anchor chart, and showed them the meanings that I came up with before class started. 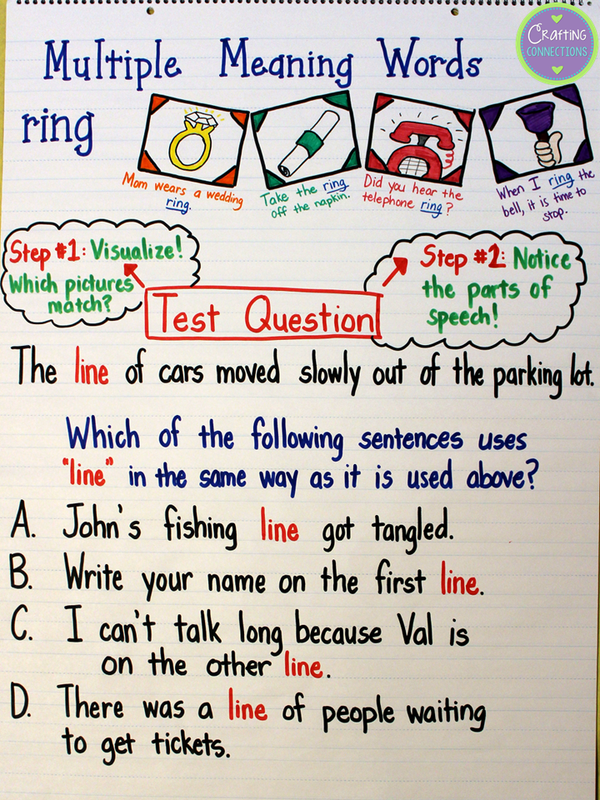 Next, we looked at the test question example at the bottom of the anchor chart. I asked my students to describe what they visualized when they read the sentence in the question stem, and each of the answer choices. I attempted to draw quick sketches based on the visualizations my students described. Based on my students' descriptions, my anchor chart looked like this after our discussion. 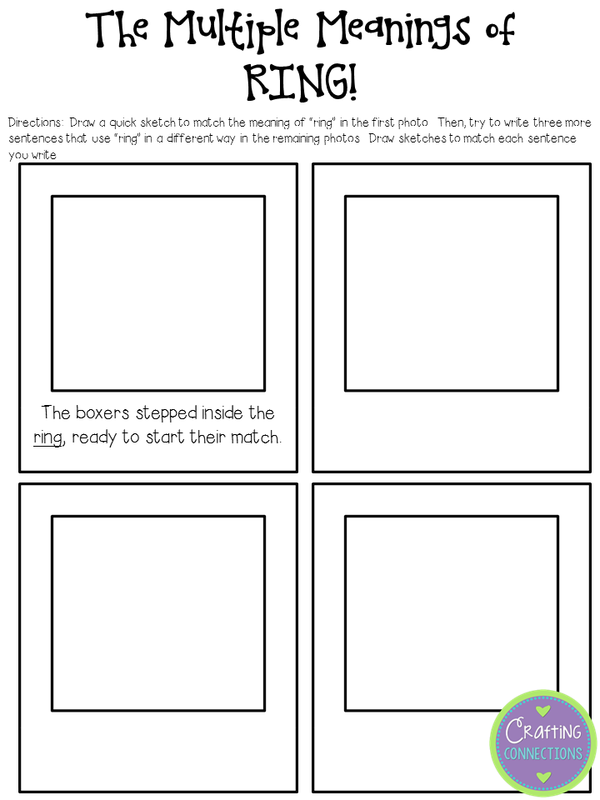 Ultimately, we all agreed that the picture we created for answer D was most like the picture we created for the sentence in the question stem, making D the correct answer. 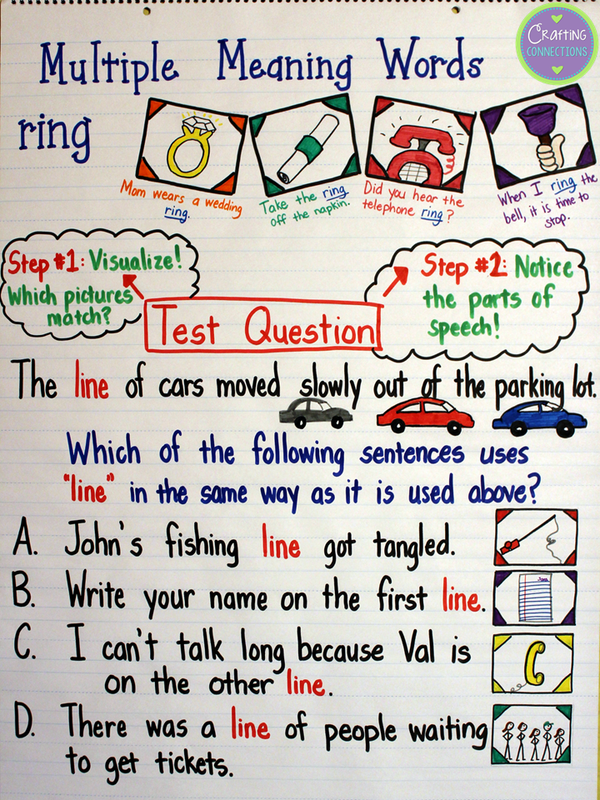 Are you wondering about the "Step 2" listed on this anchor chart? Mom goes for a run on Saturday mornings. used in the sentence above?" A. Do you think you can run faster than Kim? B. The melted wax began to run down the candle. C. John was exhausted after his 15-mile run. D. Don't run into the sign! At first glance, answers A and C could both seem like plausible answers because you would visualize similar pictures when considering each sentence. However, when you identify their part of speech in each given sentence, you see that in the sentence stem, "run" is a noun. In Sentence A, "run" is a verb. In Sentence C, "run" is a noun. Therefore, C is the best answer for this question. Great ideas for supporting struggling students! Adding the pictures is so helpful. Your anchor charts are awesome!!! What a fun idea for a linky party. 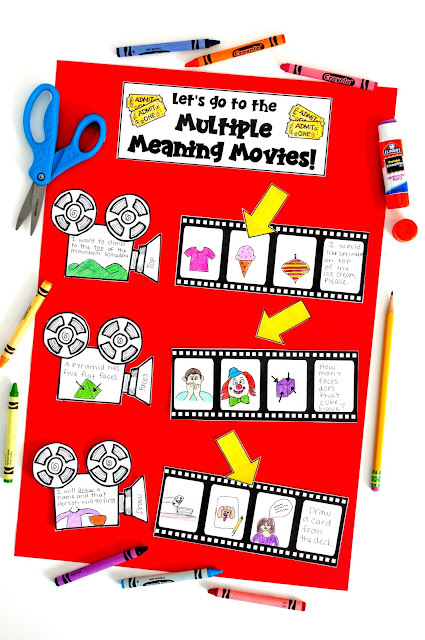 Thanks for sharing your 'multiple meaning words' ideas.